Recently when Ranbir and Deepika were busy promoting their upcoming release in a suburban studio, they had a surprise visitor. It was Ranveer Singh who surprised everyone around when he came to meet Ranbir and Deepika when he was passing by the studio. 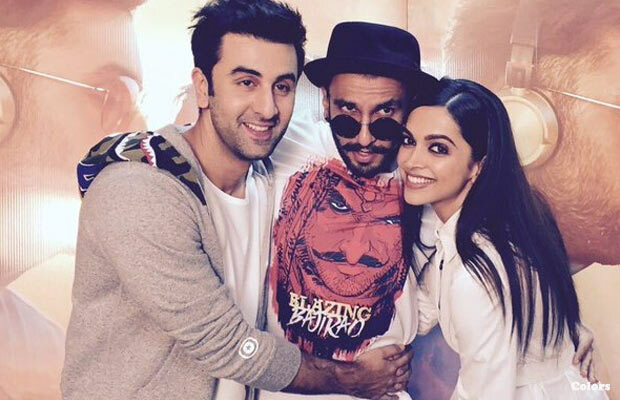 Not only did he come there but he also promoted Ranbir – Deepika‘s next with them. He told Ranbir Kapoor how excited he was to watch their film and how he is really looking forward to it. Interestingly, Ranveer also broke into a jig, and did the signature step from Matargashti along with Ranbir and Deepika. Also Read: Ranbir Kapoor: When I’m With Deepika I Feel Like I’ve Come Back Home! He was also heard telling Ranbir Kapoor how he loves the song ”Wat Wat” the most from the music album and Ranbir and Ranveer were even seen doing the Wat Wat step together. Imtiaz Ali’s next marks the return of the golden pair, Ranbir – Deepika back on the silver screen and there is a lot of anticipation among the audiences around the film. The films has been the most talked about ever-since the unison of Ranbir and Deepika for the film made headlines, the films music further added fuel to fire and the ongoing promotional activities further add buzz to the film. Tamasha showcases the most loved pair Ranbir Kapoor and Deepika Padukone, who were last seen together in 2013, coming together on the silver screen on the 27th of November. Presented by UTV Motion pictures and Nadiawala Grandson Entertainment, Tamasha is directed by Imtiaz Ali and produced by Sajid Nadiawala. Also Read: Inside Photos: Shah Rukh Khan, Hrithik Roshan And Others Celebrated Diwali With Bachchan Family! Also Read: Bigg Boss 9 With Salman Khan: OMG Aman Verma Caught Red Handed! Also Read: Too Much Love: Kareena Kapoor Khan And Saif Ali Khan Can’t Keep Hands Off Each Other! Next articlePhotos: Ranbir Kapoor And Deepika Padukone Look Adorable Together At Tamasha Promotions!